There are 25 Assisted Living Facilities in the Everett area, with 15 in Everett and 10 nearby. The average cost of assisted living in Everett is $3,223 per month. This is lower than the national median of $3,346. Cheaper nearby regions include Marysville with an average starting cost of $2,672. To help you with your search, browse the 113 reviews below for assisted living facilities in Everett. On average, consumers rate assisted living in Everett 4.3 out of 5 stars. Better rated regions include Marysville with an average rating of 4.3 out of 5 stars. Caring.com has helped thousands of families find high-quality senior care. To speak with one of our Family Advisors about assisted living options and costs in Everett, call (855) 863-8283. In Everett, seniors can watch the Everett Aquasox play baseball, catch a show at the Historic Everett Theatre and wander through the Future of Flight Aviation Center. Seniors can also choose from 44 assisted living facilities in the Everett area, 15 of which are located within the city. The Aging and Long-Term Support Administration from the Washington Department of Social and Health Services monitors the care provided by assisted living facilities in Everett, and all of Washington state. The Everett area is home to world-class medical facilities, including Providence Hospital and Kaiser Permanente Everett Medical Center, in the event of medical emergencies or illness. Temperatures in Everett are mild when compared with the frigid winters of the northern states and the scorching heat of Southern summers. Average temperatures in Everett fluctuate between 36 degrees Fahrenheit and 77 degrees Fahrenheit, with the coldest temps occurring from November to February. Umbrellas are a must for seniors in Everett, especially from October to April when the city averages a 35 percent chance of rain each day. Everett is only safer than 4 percent of U.S. cities, so seniors should exercise caution at home as well as while out running errands. Property crimes are common in Everett, and residents have a one in 19 chance of falling victim to one. Violent crimes are also a concern, though they occur less often than property crimes. The Everett Transit system runs seven days a week and includes some holiday routes. Discounted fares at the rate of $0.25 are available for disabled residents and seniors age 65 and older. In 2018, the city celebrated Everett Transit's addition of its first all-electric bus. Washington state has a higher cost of living than the U.S. average, and Everett exceeds both of these figures. The city holds a score of 123 compared to Washington's 121 and the U.S. average of 100. Groceries, health care and transportation also cost more in Everett than the Washington average. Everett sits in Snohomish County, which has poor scores for particle pollution from the American Lung Association. Seniors with compromised immune systems may find it difficult to breathe easily in this polluted city. Assisted Living costs in Everett start around $3,223 per month on average, while the nationwide average cost of assisted living is $4,000 per month, according to the latest figures from Genworth’s Cost of Care Survey. It’s important to note that assisted living rates in Everett and the surrounding suburbs can vary widely based on factors such as location, the level of care needed, apartment size and the types of amenities offered at each community. With three Medicaid programs and two waivers, Washington offers more than twice as many financial assistance options as states such as Utah, Oklahoma and Missouri. 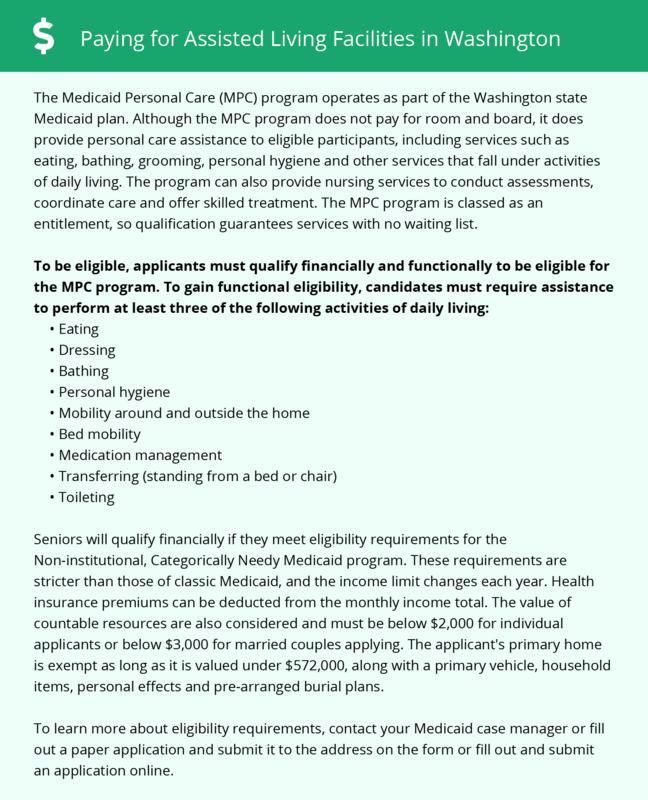 Qualified seniors may receive help from the Medicaid Personal Care Program, the Community First Choice Option, Medicaid Alternative Care, the Washington Medicaid COPES Waiver or the New Freedom Medicaid Waiver. Everett and the surrounding area are home to numerous government agencies and non-profit organizations offering help for seniors searching for or currently residing in an assisted living community. These organizations can also provide assistance in a number of other eldercare services such as geriatric care management, elder law advice, estate planning, finding home care and health and wellness programs. To see a list of free assisted living resources in Everett, please visit our Assisted Living in Washington page. Everett-area assisted living communities must adhere to the comprehensive set of state laws and regulations that all assisted living communities in Washington are required to follow. Visit our Assisted Living in Washington page for more information about these laws.